Sometimes, you may want to delete one or more contacts from your list. There are a couple of ways to delete your contacts, depending on how many you want to remove at a time. In this article, you'll learn how to delete contacts from your list. We recommend that you export your audience before you perform any bulk actions. Anything you delete from your account is permanently removed and can't be recovered. If you need to reduce your subscriber count but don’t want to lose any data, you may want to unsubscribe a contact rather than delete them. 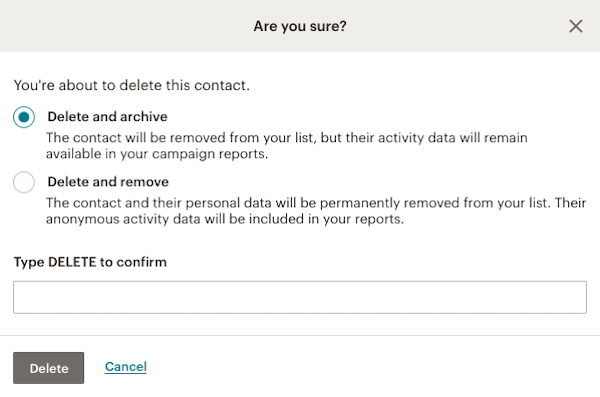 If one of your contacts asks us to remove their data from every account in Mailchimp, we'll notify you with an email. 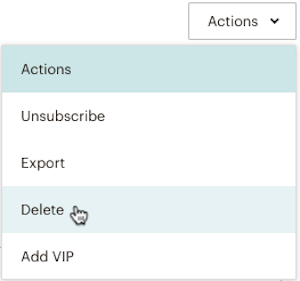 After you receive the email, you'll have 30 days to delete and remove the contact from every audience they're in, as well as any connected integrations. When you choose to delete a contact from your audience, you’ll have the option to delete and archive or delete and remove. Here are the differences between the two. 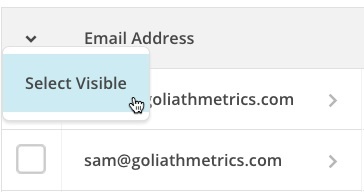 This action deletes the contact from your audience and archives identifiable activity data in your campaign reports. Two types of contacts can be deleted and archived: subscribed contacts, and contacts who were unsubscribed by an account Admin. After you delete and archive a contact, you’ll still be able to re-subscribe them. If you want to avoid accidentally re-subscribing a deleted contact, you may want to remove them instead. This action permanently removes all of a contact’s personal information and anonymizes their data in your reports. It is available for all contact types. After you delete and remove a contact, you won’t be able to add them back to your audience. However, they can choose to re-subscribe through a Mailchimp signup form. If a contact asks for their information to be completely removed from your records, you'll need to delete and remove them from every audience in your account. There are a couple ways to delete contacts. To delete one or more contacts, you’ll navigate to your audience and select which addresses to delete. You can also delete a single contact from their profile page. Then you’ll choose whether to archive or remove the selected contact(s). Remember, delete and remove is a permanent action that cannot be undone. To prevent accidental removals when deleting multiple contacts, delete and remove is not available with the Select All option. To delete one or more contacts from your audience, follow these steps. Check the box next to each contact you want to delete. To delete and archive contacts in bulk, you can use the drop-down to choose Select All or Select Visible. In the Are you sure? pop-up modal, click the button next to Delete and archive. Type DELETE to confirm, and click Delete. We'll show you a success message so you know the action has been completed. To delete a single contact from their profile page, follow these steps. Click the contact to open their profile. Click the Actions drop-down menu and choose Delete. In the Are you sure? pop-up modal, click the button next to Delete and archive or Delete and remove.